As November is American National Diabetes Month, we thought you might enjoy seeing how Ayogo’s diabetes applications have evolved over the years and read our seven key lessons learned from making diabetes apps. Our second diabetes application, Diabesties was created for the College Diabetes Network (CDN). This application was designed for young adults with type 1 and type 2 diabetes getting ready to go off to college. Jo Treitman, Program Director at CDN was a young adult with diabetes transitioning to college life on campus. Jo envisioned Diabesties providing peer-to-peer support between two students with diabetes on campus. Diabesties fostered empathetic support, and helped each student keep an eye out for poor self-care. Diabesties was a combined tracker of blood glucose (BG) readings, carbs and insulin; with a private space for diarizing feelings and observations; and a private social app—with the option of sharing blood glucose readings within the social comments. Having served its purpose for the time, the app was recently retired. The Lesson Learned from Diabesties was that social features don’t have to be public. Rather, a small “team” of two can sustain engagement for months. We also saw Diabesties being used by couples and parent-child teams, with one party doing all the logging and sharing readings, using Diabesties as a communication tool. While Diabesties addressed the gap of young adults with diabetes, Monster Manor was launched in 2013 for a younger audience, children ages 6–10 who are ready to take on more responsibility managing their condition. Monster Manor responds to the concern expressed by many parents of children with type 1 diabetes, that children do their blood glucose checks five times or more each day. Monster Manor has a collecting economy that ties to the child’s testing and logging of blood glucose ratings. Players who test and log receive a tappable Piñata that breaks open and releases “beanz” that can be converted to gold, and rare items that are used to build the collection. Variable reward mechanisms like the Piñata can be highly engaging and need to be used selectively, so that the focus on play does not overwhelm the behavioral goal of making a habit of testing and logging. The Lesson Learned from Monster Manor is that taking the time to tailor the app’s look, feel and messaging to the targeted audience resulted in an interface that children loved. We learned that it is important to continue to test, and iterate upon the design as users’ tastes shift. For example what tested well with a 10 year old in 2012 became more appealing to a 6-8 year old by 2014. Younger children will play an application designed for older children, but older children may dismiss an application if they feel is “too young”. 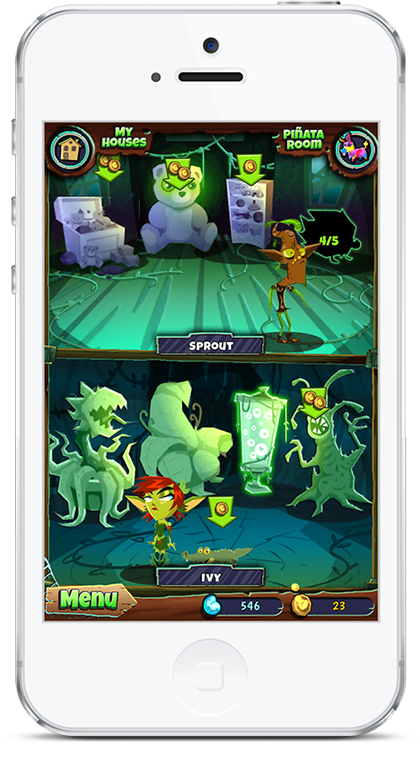 Monster Manor is currently made available by Sanofi UK in the app store to people in Britain, Scotland and Ireland. Type 2 Travelers represented a new kind of full-game experience for people with diabetes, designed to be social to sustain engagement of adults managing Type 2 Diabetes with a curriculum of lifestyle change, diabetes education and self care. To keep things interesting in Type 2 Travelers, there are social forums, minigames and an ever-changing curriculum of fun-to-try self-care activities. So far, in early tests, Type 2 Travelers was a huge hit with older users (average age 60). Pharma partners would be excited to know that thousands of messages of peer-to-peer tips and encouragement, without a single adverse event, using only peer-based moderation tools. We’ll keep you posted about when and where Type 2 Travelers is released to the public. For now, it’s available in limited release to self-insured institutions. Lesson Learned for Type 2 Travelers was that just the presence of peer moderation tools, (such as the ability to flag a post for moderation), helps keep peer-to-peer sharing focused and helpful. Next we come to Fit2Me. Fit2MeCoach.com launched in 2015 and within 6 months had over 1 million unique users. Fit2Me is AstraZeneca’s patient education and marketing focal point for a strategy to activate healthcare consumers managing diabetes. 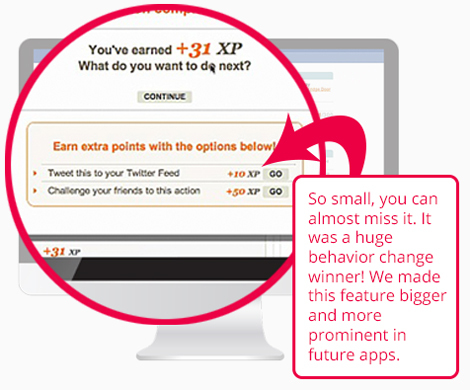 Users work with a digital coach of their choosing, interacting in a simulated social interface. Users complete a playful activation process, with a clear goal of developing a lifestyle plan “custom fit” to their preferences and engage with educational and diabetes management tools suitable to them. Ayogo developed the complex, interactive digital interface, creating a social effect and gamified experience that continuously provides the healthcare consumer with a stream of value using a high-tech, high-touch design. Lesson Learned #1 from Fit2Me was that a digital coach can be a successful stand in for true social features. Lesson Learned #2, adding delightful, humorous and unexpected elements to the activation process can give users the encouraging feeling that they are having fun, even when providing information. 1. Social engagement is more powerful than any other gamification element in sustaining engagement over time. Socially engaging peer-to-peer communication with other patients with diabetes is most meaningful. Even if true social features are not possible, a digital proxy such as a coach, can still provide some of the same effect. 2. Use personal, incoming messages such as, “Hey Jay! I want you to work on this lifestyle challenge with me. Are you in? Chris. ” Chris, will increase Jay’s intention and put both Jay and Chris on the path to action. 3. All social features can be tiered for privacy. Social features don’t need to be public. We’re not necessarily talking about broadcasting to the world, or even other users of the app. Whether it’s your mom or a buddy, sometimes just having one person see your readings is all you need. 4. Design the user experience so the user will recognize themselves. Hypertune the tone of voice, narratives, storytelling and artwork to the target audience. You only get one first impression and and a “not for me” impression means the user is lost. Will your app feel too old or too young for your audience? Tuning the user experience requires ethnography, design thinking and social research. Tastes can change, so be prepared to iterate. Ayogo has five full-time user-experience designers on staff to get things right, every time! 5. Use delight and gamification when requesting information from the patient. Providing delight reverses the perceived flow of value back to the end user. 6. Incorporate diabetes-related Personal Health Record (PHR) storage or integration into a mobile app. This fosters communication between healthcare professionals and patients. 7. It will be less costly to license and customize a technical foundation than to start from scratch. Integrating social features, delightful content, tiered privacy, PHR integration and a gamified economy creates a lot of technical complexity. Ayogo’s Empower platform can bootstrap your project. We have seen the power technology has to help people with diabetes and others manage chronic conditions. Continuous monitoring, optimizing decision support and interventions, social support and behavior change technology are transforming healthcare as we know it.